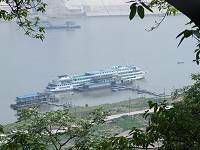 We arrived at Chong Qing to join our boat for our Yangtze River cruise but due to the lack of rain recently the water level was too low for the cruise boat to get to Chong Qing. Instead, we were going to have to join the cruise ship in Fengdu, but first we were met by our local guide, Simon Han, at the airport. Simon speaks very good English, and took us to visit Ciqikou Ancient Town. The Ancient Town is perched on the hill overlooking the Jialing River and dates back to the late Ming dynasty. Most of the old buildings have now been restored & preserved. The path into the ancient town is lined with shops & restaurants. Because it was May Day holiday the whole village was packed with visitors. Just off the busy central street of shops in a quiet lane there was a museum formed from one of the preserved grand old houses. 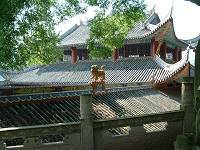 We entered into the courtyard, as most old Chinese houses were designed in this way, a courtyard in the middle of the house open to the sky, the tranquillity & calm of the place immediately affects you. 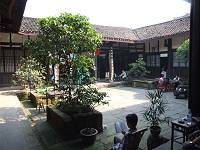 Some Chinese people were having tea or reading in the courtyard, which was filled with plants, trees, tables & chairs. All the rooms opening to the courtyard were displayed as they would have been when occupied by the members of the wealthy family who owned the house. We had an early buffet dinner at a local 4* hotel before joining the cruise ship bus to travel to Fengdu, because of the low water. The bus journey took a total of 4 hours through cities, towns & hills arriving at Fengdu port around 10 pm. There were several coaches all arriving at the same time. We carried our hand luggage & walked down the steps to the welcome tune of a brass band from the 5* China Regal Princess Sheena cruise ship staff. We picked up our key for our cabin on an upper deck & our luggage arrived at the door. The room was medium size with a bed on each side & a table beneath the window. There was also a wardrobe at the end of one bed. The en-suite bathroom had a shower and w.c. If you want more room the suites next to us were very large, with sitting room and separate bedroom. Of course this is at an upgrade price. Next morning breakfast was between 8:00 and 09:30 with open seating in two dining rooms on deck 3 & deck 4. For early risers there was an Chinese Tai Chi exercise class on the sundeck. Next was the Safety & River briefing meeting at 09:30. It was followed by Traditional Chinese Medicine & Herbal demonstration before lunch, which was served from 11:30 - 12:30 & 12:50 - 13:50 in two sittings. If the water level had been normal we would have been sailing from Chong Qing to Fengdu that morning & had the briefing the previous evening. We only missed about 4 hours sailing from Chong Qing to Fengdu through a rather industrial landscape. The scenic route is from Fengdu onward. The highlight of today in Fengdu was the afternoon tour of Fengdu's famous Ghost City & the evening's Captain’s cocktail party plus crew’s own show. The Ghost City is on Ming Shan Hill Park. 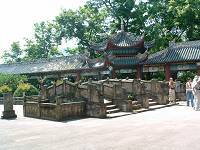 It is a large hillside park with Chinese pagodas, temples & gardens. You can either walk up to the Ghost City complex or take the popular cable car to the top. As I am not good with cable car journeys we walked up Ming Hill. It takes about 15 minutes upward but was worth it. We walked through quiet areas of parkland & temples with view of the Yangtze River & cruise ship below in the distance. We arrived at the Ghost City with the first impressive Temple that has 3 bridges to cross. The three small bridges represent Wealth, Love & Health from left to right facing the temple. We were told to cross by the middle bridge on the way in & return by either the wealth or health bridges later. 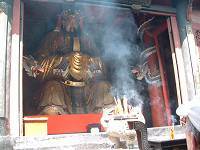 We continued upwards to another temple with large gold Chinese figure sitting behind the red doors, visible through the smoke of the Chinese incense sticks. There is a story that a Taiwanese couple came many years ago & prayed here and all their wishes came to true after they returned to Taiwan. There are other darker temples on the way up to the top such as the Palace of the King of Hell, The blue pagodas (blue represents death in Chinese) etc. These temples have sculptures of demons & devils and were built since the Tang dynasty. One thing to remember is not to call after someone on the way up because no one is supposed to turn round whilst going up to the Ghost City. Our ship set off 18:00. We met our cruise ship captain at his party on the sundeck at sunset with the rural views of green hills & terraced countryside, passing by small towns on each side of the Yangtze River. After dinner we were treated to a traditional Chinese folk song & dance performance by the crew. This was a highly entertaining show with very good standard of singing, dancing & playing musical instruments. It is nice to know that the waitress serving us breakfast this morning would sing & dance so beautifully while the young man from the kitchen department can also play lovely Chinese musical instruments. As the evening came to a close we were reminded that tomorrow was a big day for entering the first two of the famous three Gorges. The first Gorge would be entered at 06:10. It was time for early bed. Almost all the passengers were at the sundeck or bow deck by six in the early morning. 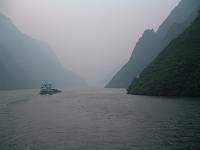 The Yangtze River is very misty at dawn. This creates a mysterious beauty. We entered first Gorge, the Qutang Gorge. This is the shortest at just 8km long but the scenery is considered to be the most dramatic. By now the morning mist was clearing & everybody was on deck to witness the scene. The other important feature on the Qutang Gorge are the famous hanging coffins, situated high on the sheer faces of the gorge. These coffins were the way that ancient people buried their dead along the Yangtze River dating back to the 'warring states' period. We saw one shortly after entering the Qutang Gorge. 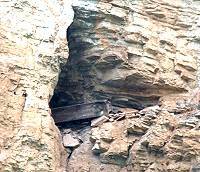 The wooden coffin was visible, resting at the entrance of a cave halfway up the cliff. Have your camera ready as the scenery passes quickly as the boat cruises on. Twenty minutes later we were through the first Gorge & everybody left for breakfast. About an hour later at 07:30 we were entering the second Gorge, Wu Gorge. 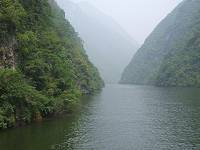 Wu Gorge is about 40km long with cliffs on either side rising to over 900m high. Wu Gorge is famous for its twelve peaks, such as the Goddess Peak & the Peak of the Immortals etc. The journey took us gracefully & quietly through the beautiful cliff and mountain scenery on both sides of the river.